Community members held a vigil outside of Atlah Worldwide Church, where the pastor places homophobic messages, to pay their respects to the victims in Orlando. 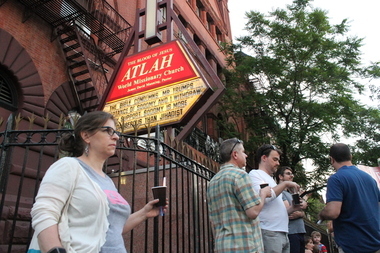 HARLEM — A vigil for the victims of the Orlando shooting focused on Harlem's homophobic Atlah church. Dozens held a candlelight vigil Wednesday outside Atlah Worldwide Church, paying their respects to the 49 killed and 53 wounded at the gay night club Pulse Sunday while protesting hateful messages posted by the house of worship. “This is the scene of the crime,” said Michael Henry Adams, referencing the anti-gay messages Rev. James David Manning puts on a marquee outside the Malcolm X Boulevard and 123rd St. church. “How crazy is it that just blocks from here a transgender woman was killed?” he said, alluding to the 2013 killing of Islan Nettles who was savagely beaten by a man near West 148th Street and Eighth Avenue. Adams said it’s hypocritical that the city has vowed to protect LGBTQ members, while the pastor’s anti-gay messages — including one that said "Jesus Would Stone Homos" — remain on the marquee. “This sign inspires the hate that killed Islan Nettles and (the victims) in Orlando,” he said. Manning, the pastor, told DNAinfo New York earlier this week that he does not believe he is spewing “hate speech” because he is quoting from the bible. He was unavailable for comment Thursday. “I live on this block and I can’t bear it,” said Stacy Parker Le Melle, who helped organize the vigil and has been holding protests in front of the church since 2014. She said after the Orlando shooting happened it was clear the community needed to continue to rally against the church's homophobia. “We might not be able to stop him from putting up the sign, but we can come out and say something,” she said. Blocks away at the Adam Clayton Powell Jr. State Office Building, on West 125th Street, community members, faith leaders and local groups also came together for a remembrance event for the Orlando victims. The event was organized by The NYC Equality Coalition, which includes a number of black and Latino LGBTQ groups and local politicians. Many spoke of the stigma that the LGBTQ community faces. Adriel Muñoz, who said he lost two friends in the shooting, gave an emotional speech about the independence gay clubs like Pulse allow LGBTQ members to have. Other members rallied for action and for the LGBTQ community to continue pushing for equality and visibility. “I come here today to stand loudly and clearly, so my voice can be heard against those who try to divide us,” said Hazel Dukes, a famed civil rights activist and former president of the NAACP.